HOT PINK style: Taylor Street FESTA ITALIANA! So, this weekend was the Taylor Street Festa Italiana in Chicago. The worst part about any street fest is having no place to relax amongst the crazy crowds. Lucky for us, we had two! Our awesome friend Amanda, who lives right smack in the middle of the fest, provided us with a sweet and secluded back patio full of drinks and snacks! Cheers to the fabulous hostess. Our other spot was a cute little pet store, Tails on Taylor, where we met three tiny little abandoned kittens that had been brought in after being discovered on the street. Elisa feel in love with the black kitten that she named Bella and decided to adopt. Two kittens still left needing a home if anyone is interested. Overall a fun and interesting night spent with great friends. 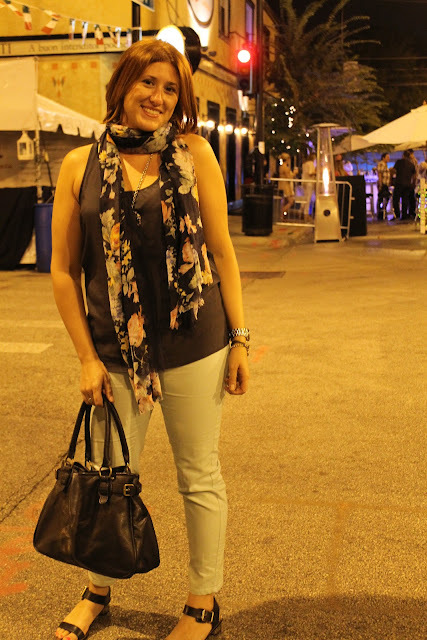 Mint pants: Forever 21, Charcoal tank: (old) Forever 21, Sandals: Sam Edelman Trina, Scarf: Zara, Bag: H&M, Necklace, Vintage. Pretty yoga ladies enjoying our patio retreat! I am such a fan of mint and navy together - great look!